CLBT, which is part of the Bertschi AG group, one of the biggest logistics European company, asked Kopron to design and produce a new temporary storage building for storing plastic material. They collect material coming from many companies, and needed more space to host plastic material arriving by train. Mr Francesco Grasso, Kopron’s area Mgr, found a logistics solution perfectly meeting Customer’s requirements. 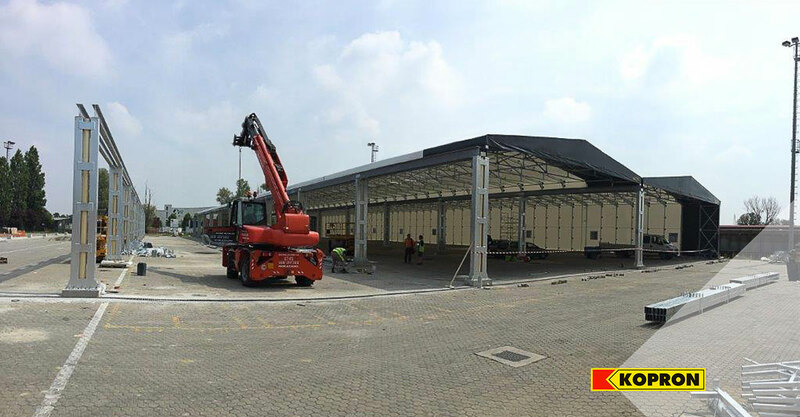 The temporary storage building completed by beginning of September 2017, is 60mt wide x 90mt long a 5 mt tall, and covers a total surface of 5,400 square meters. This structure has totally been produced at Kopron’s premises in Italy, and consists of a body in hot-dipped galvanized steel, and a PVC Grey, Class II covering. Installation was carried out according to Customer’s schedule. A new logistics space was created in only two weeks. 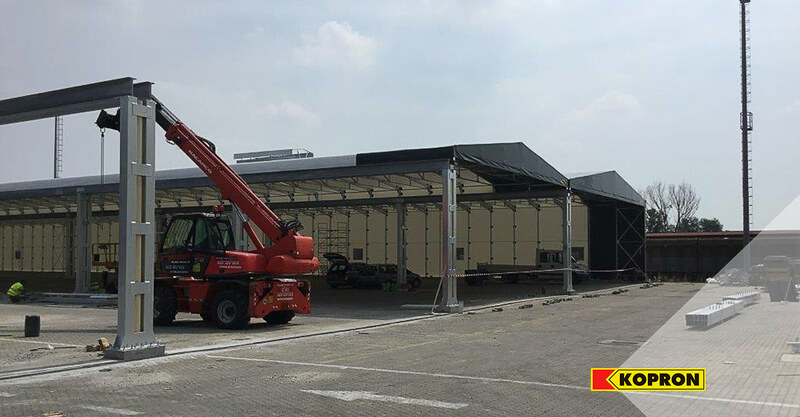 Michele Poggi, Logistics Manager at CLBT was very satisfied of the preliminary technical support received as well as of the final installation. 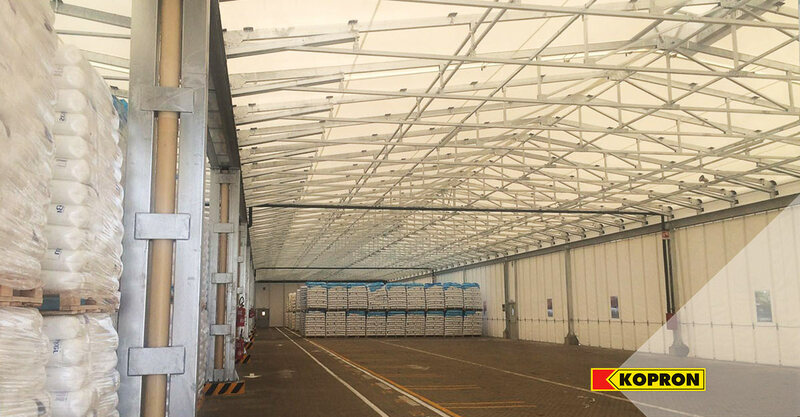 He reckons that this type of solution created by Kopron offers any company the possibility to enhance production space in safety and in short time. 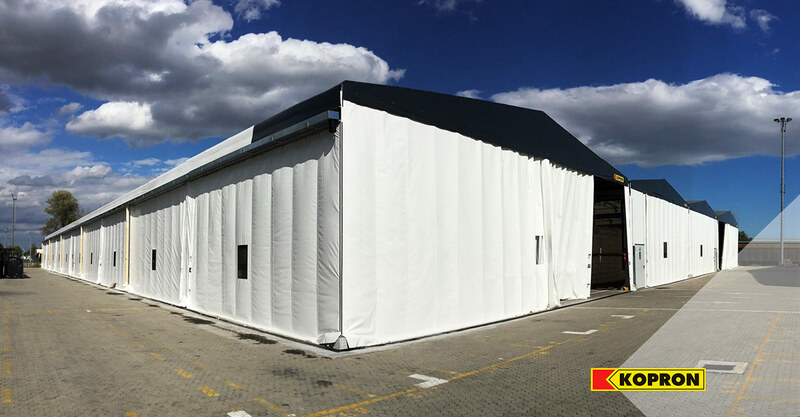 Kopron industrial steel buildings become a strategic asset for all enterprises willing to widen their premises with ease. If needed, this kind of structure can also be dismantled and re-installed elsewhere. Bertschi AG Group is specialized in transport of solid and liquid chemical products. By acquiring CLBT, the Bertschi AG Group reinforced the logistics sector of plastic material, becoming one of the most important operators in Europe. CLBT have premises within the ‘Interporto di Bologna’, the freight Terminal located at Bentivoglio, near Bologna (Italy). A strategic area, which is right in the middle of the connections between North and South Italy, and between Italy and North Europe. The company was founded in 1968, and offers all logistics services: storage, goods handling, transport by truck (goods either loose or stacked on pallets), intermodal transports, international deliveries (by truck, sea, and air). They take care of the logistics chain from beginning to end.